This year's Lustration of the Ancestors will be held in Danville, Illinois, homeland of the Correllian Tradition. To Register for the Lustration of the Ancestors 2019 click HERE! 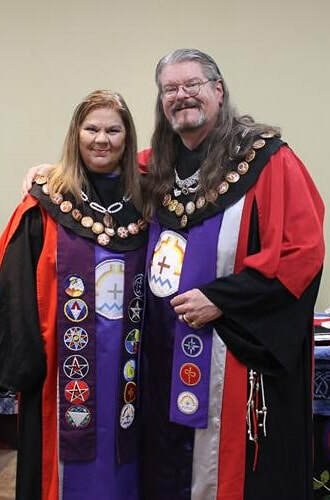 "As is our custom Lady Stephanie and I like to begin the new calendrical year with a New Year’s Address to the Tradition sometime during the first or second week of each year. * For all of your Correllian needs, check out the Tradition's new CORR STORE! * Check out the new Correllian Intensive Program! Here you can learn more about the Correllian Nativist Tradition, its leading members, activities, and locations around the world. Through our Adventure Pages you can also enjoy photo essays about Correllian events past and present. ​So what is the Correllian Tradition, and what makes it different from other Wiccan Traditions? ​Usually when people ask this they are expecting a liturgical answer -some special beliefs or ritual forms that are unique to Correllianism. Correllianism does put an unusually strong emphasis on the philosophical aspects of Wicca, and on the spirituality and inner mysteries of the Wiccan religion, but liturgically our beliefs do not especially differ from those of other Wiccan Traditions. Rather it is our attitudes toward the Pagan community and its future that tend to set us apart. The Correllian Tradition is dedicated to the advancement of the Pagan people. We believe strongly in the need for increased communication and co-operation between Pagans everywhere, from all Traditions. We stress the importance of the Pagan Clergy as teachers and facilitators, and the need for a strong public presence. The Correllian Tradition emphasizes celebratory as well as initiatory Wicca, and is strongly committed to accessible public ritual. But perhaps the one thing that most sets Correllian Wicca apart is that we have embraced the internet as an educational tool. Correspondence teaching is nothing new in Wicca, but we were the first to utilize the internet as a serious tool for training new initiates. This has brought great expansion and many changes to our Tradition. Another thing that makes Correllian Wicca different from many other Traditions of Wicca is that we are a unified Tradition with a single leadership. The entire world-wide Tradition has a single structure allowing us to act together as few other Traditions can. The leading bodies of the Correllian Tradition include; The Witan Council, which is made up of all Temple Heads, Elders, and Officers of the Tradition; and the Correllian Council of Elders which includes the Heads and Officers of the Tradition, and its most respected members. The chief administrator of the Tradition is the Chancellor, who represents the Tradition’s leadership. The leadership of the Tradition includes the Tradition’s Heads and Officers, a description of whom may be found under STRUCTURE. Additions are made to this website with increasing frequency, especially the Temples page and the adventures pages, so check back often. May the Blessing Be upon you!